This Place Does Chicken Burgers On Steroids! One must visit a Bird restaurant to indulge in an amazing doughnut ice cream sandwich at least once in their lifetime - but only after experiencing the main attraction - a Bird waffle burger. At just under fifteen pounds it doesn't come very cheap, but it's so filling you could probably share one. Try a root beer too - Bird stock a really nice one. Don't bother with the so-called cheesy chips at Bird. Unless you're a fan of bottle cheese, that tastes more like mayo. The other burgers at Bird are rather succulent too, but like I said the waffle burger is what one initially goes to Bird for. I always order mine without bacon. The first time I went to Bird I ordered chicken n' waffles which was a let down. Pricey and lacking in flavour. 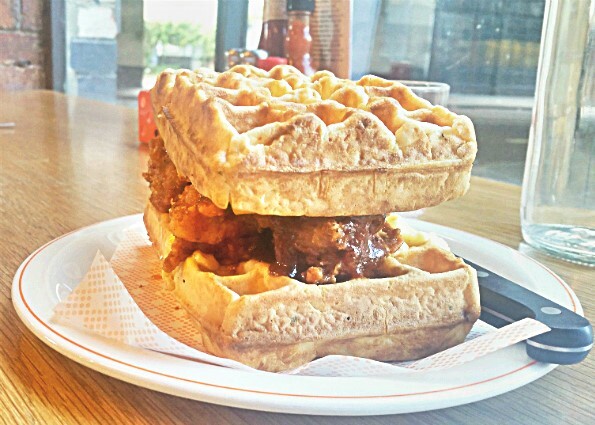 The waffle burger at Bird on the other hand is bellisimo! Thick savoury waffles with a rich, tangy tomato sauce inside. Melting cheese and a large piece of tender, juicy chicken. You can tell their chicken really is free range. It always tastes super fresh and the batter is perfectly crisp. I would even go as far as to travel to Bird just to take pleasure in a doughnut ice cream sandwich alone. A soft sticky doughnut ring is sliced in half and filled with heaps of delicious vanilla ice cream. Yummy chocolate (or caramel) sauce and the whipped cream of dreams. The doughnut burger at bird is yummy. Not too sweet. Soft, glazed ring doughnuts sandwich Bird's infamous fresh battered chicken and melting cheese. The doughnut burger at bird also comes with bacon but I don't eat bacon so I order without. Bird is a casual restaurant with four locations. Service has been decent enough whenever I've been. I've also tried the flavoursome wings and the Korean Gee Gee burger at Bird, which is tender and juicy with a nice flavoursome coleslaw stacked between two soft buns. Bird restaurants are within short walking distance from local train stations and more are set to launch! The restaurants have a bit of a buzzing atmosphere with a mixed crowd from all ages and cultures. The waffle burger. The doughnut burger. The doughnut ice cream sandwiches and..the chilled root beer. Don't let other poor quality root beers put you off! Found this Bird restaurant review useful? Subscribe to www.GoneSunWhere.com for food and travel inspiration.